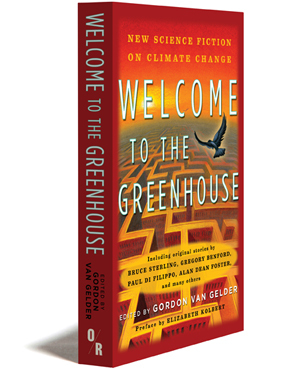 All royalties from sales of this book go to NRDC’s Gulf Coast recovery efforts. Deepwater Horizon was supposed to be the cutting edge of energy exploration: drilling 5,000 feet below the surface of the Gulf of Mexico, the $560 million rig would be indispensable in helping to solve the ongoing energy crisis. Then, on April 20, 2010, BP’s dismal safety record came home to roost. An explosion followed by a massive fireball resulted in eleven lives lost, the sinking of the rig, and the release of millions of barrels of crude oil into one of the world’s prime fishing grounds: tens of millions of barrels suffocate the Gulf’s waters, and the resultant slick covers 2,500 square miles. Wildlife throughout the region is devastated, and so is the human community dependent on harvesting the area’s resources. 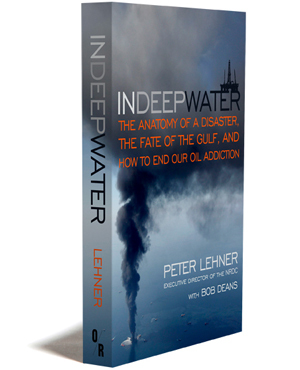 Now, OR Books has joined with the Natural Resources Defense Council to release IN DEEP WATER: The Anatomy of a Disaster, The Fate of the Gulf, and How to End Our Oil Addiction, the first book to appear on this environmental catastrophe, the largest offshore spill in American history. Written by Peter Lehner, executive director of the NRDC, together with Bob Deans, this book provides a brief account of the disaster as well as the policy failures that caused it––and lays out a blueprint to avoid similar catastrophes in the future. Bob Deans, author of the 2007 book The River Where America Began: A Journey Along the James, was the chief Asia correspondent for the Atlanta Journal-Constitution and other Cox newspapers, and spent eight years covering the White House. He is a former president of the White House Correspondents’ Association. It was just before ten on an April night, and a soft breeze blew over the Gulf of Mexico. For Mike Williams, though, the calm was shattered by the furious hissing of gas, tens of thousands of cubic feet of it, rocketing up from three miles below to the deck of the Deepwater Horizon. Chief electrician aboard the giant drill rig, forty-eight miles from shore, Williams heard an ear-shattering whine. Diesel engines strong enough to power a jumbo jet began revving out of control, supercharged by the wild gas sucked through air intakes, throwing the generators the engines ran into overdrive. As the machinery ripped past redline, Williams watched in horror as the lights in his workshop, then his computer monitor, flared a blinding magnesium white, then blew out from the electrical overload. As he groped in the darkness for the handle of a fire-resistant steel door three inches thick, a bone-rattling explosion blasted the door off its hinges and pinned Williams against the wall. Williams told Scott Pelley of CBS News. Crawling on hands and knees across the debris-littered floor, Williams was rocked by a second explosion before making his way outside, to a deck that looked like a combat zone. A black slurry of seawater, mud and oil had shot up from the well the rig was drilling, gushed like a fountain from the spindly derrick overhead and rained down onto the deck. The derrick was in flames, a raging inferno fueled by gas and oil gushing from the runaway well. Fire was spreading. More explosions rocked the rig––sixty million pounds of steel––like a dinghy hit with a cinder block. Lifeboats shoved off. Rig workers abandoned ship any way they could in a panicked and chaotic flight from the searing flames. With blood in his eyes from a gash on his head, Williams grabbed a lifejacket. Swimming for his life through dark and oily waters and away from flames spreading over the sea, Williams was picked up, pulled into a small boat and taken to the supply ship Damon B. Bankston nearby. At eight the next morning, after standing by the burning rig for an all-night vigil in hopes that additional survivors might show, the Bankston began the long trip to shore with Williams and other rig workers aboard. The Coast Guard searched for three days without finding a trace of the men who’d gone missing. Williams and 114 other rig workers survived the April 20 blast. Eleven others would never be found. After two days of burning at sea, the Deepwater Horizon collapsed in mile-deep water over an area of the Gulf called the Mississippi Canyon. As it descended, the rig kinked and tore the steel piping that tethered it to the well, opening a kind of gas and oil volcano that sent nearly 200 million gallons of crude oil into the ocean over the next three months. The oil poisoned thousands of square miles of deep ocean, coastal waters, beaches, tidal estuaries and wetlands. It threatened wildlife and habitat from Galveston, Texas to the Florida Keys. It forced the closure of a quarter of the Gulf waters to fishing, throwing thousands of watermen out of work and put at risk the way of life, and the livelihoods, of millions of Gulf Coast families. On June 15, formally addressing the country from the Oval Office, President Barack Obama said “Already this oil spill is the worst environmental disaster America has ever faced.” It would become, in the weeks ahead, the largest peacetime oil spill in the history of the world. This is the story of the Deepwater Horizon offshore oil disaster, its causes and effects, the role we’ve all played in this epic debacle, and the road we must travel from here. It is a story of corporate hubris on a colossal and frightening scale. It is a story of short cuts, missed opportunities and warnings ignored. More than a tale of one company, this is the story of an entire industry, the richest and most powerful in the world, that, for far too long, has lived by its own rules, and the rest be damned. It is also a story, though, of a nation grown so dependent on a single fuel that we’ve allowed, and in ways enabled, the oil companies to run roughshod over essential safeguards. We’ve watched, and encouraged, our political leaders, as they’ve attacked and steadily undermined an entire body of protections put in place to preserve our environment and defend our health. And we’ve created tax breaks and other incentives to drive the industry to produce ever more oil, even as doing so has required the oil companies to push the limits of what’s safe and reliable and to take extraordinary, and increasing, risks, often without an operative Plan B. All too often we’ve turned a blind eye to those risks, part of a broader public failure to understand what we’ve called on the industry, and the people who work in it, to do on our behalf. The simple fact is, most of us have little or no idea what is required—from an economic, personal, political, technological, diplomatic, industrial, military or environmental standpoint––to provide this country with the oil we depend on, nearly 800 million gallons every single day, to power our airplanes, cars, trucks and boats with cheap and dependable fuel. Unless and until we change that, the costs to our Earth will increase, as our demand for this fuel pushes the people and the companies that find and produce it to go to ever-greater lengths, and take on ever-growing risks, to feed our unbridled addiction to oil. That is the great and abiding lesson of the fall of the Deepwater Horizon. That is the cautionary tale we cannot ignore.